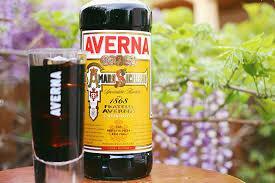 Amaro Averna is an authentic Italian liqueur for after dinner. Averna's ingredients give it a richness, full body and smooth taste with a delicate citrus fragrance, able to transport you to the warm lands of Sicily and to evoke a world of unsurpassed beauty. Averna is produced using the original recipe given to Salvatore Averna by Fra Girolamo, a Benedictine monk from the Abbey of the Holy Spirit in Caltanissetta. This recipe has been passed down since 1868.